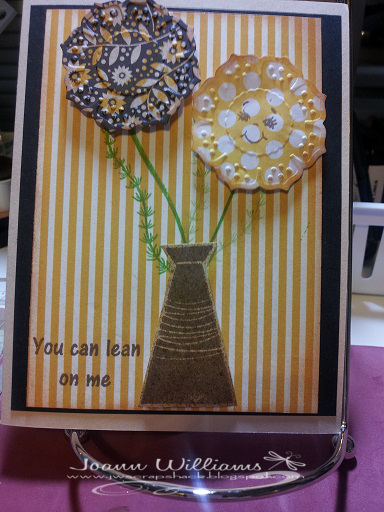 ~Jo's Scrap Shack~: Cardz TV's Challenge #27 "Mix It Up!" Cardz TV's Challenge #27 "Mix It Up!" Hey there everyone! It's time for another challenge at Cardz TV! Cardz TV Ch# 27 "Mix It Up!" I am not good when it comes to mixing multiple patterned papers, so this was definitely a struggle and definitely not my best work! I used a stamp set called "With Love" from CTMH for the flowers, flower vase and leaves. I stamped the flowers on patterned papers that I got from a Recollection's paper pad with some momento rich cocoa ink and fussy cut them. I then stamped the yellow flower with a peachy keen stamp. I also stamped the vase in rich cocoa ink onto some white bazzill paper and inked up the edges with tea dye distress ink. I inked the leaves/stems in Papertrey Ink's "new leaf" ink. 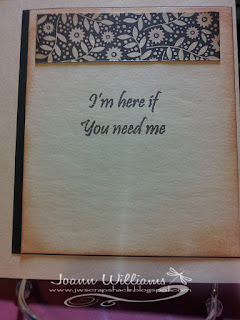 The sentiment, "You can lean on me" is from the stamp set "More Encouraging Thoughts" by Mary's Cardz TV Stamps and I inked that up in the momento rich cocoa ink. My cardbase and 1st layer paper are cardstock by Bazzill. The pretty yellow/white pinstripe paper is also from the Recollection's paper pad that I used for the flowers. 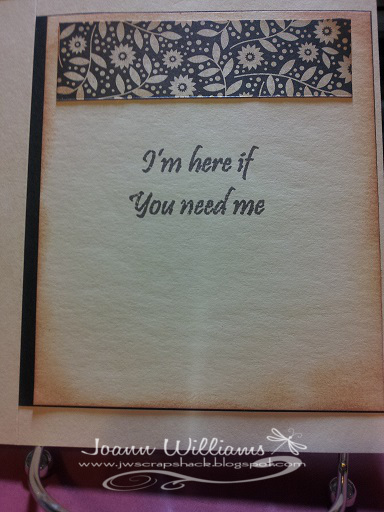 Here is a peek at the inside which also has a sentiment, "I'm here if you need me" also from the Cardzs TV stamp set "More Encouraging Thoughts". Here is the stamp set I used for today's card and if you would like to purchase this set, you can just click HERE and get it! Thanks for stopping by today! 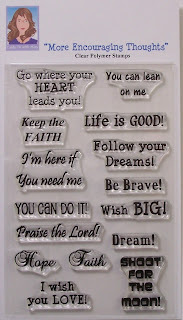 Please make sure you stop by the Cardz TV Blog to see all the wonderful creations my design team sisters have created! They really did an outstanding job on this challenge! Maybe you will want to take the challenge and link up your own project! Have a wonderful weekend my friends! Love the flowers!! Super cute! Jo! This looks great-- love the colors and you did an awesome job putting the designs all together! Great card Jo! I love your papers you chose, they work well together! I also love the cute PK faces on your flowers! Hope you arrived in PA safely my friend! Hugs! Your card is Very pretty! and a Cute PK flower!! Jo, those flowers are adorns! Especially love the PK face too! This card would truly cheer up anyone feeling a little down, especially with the happy flower face. Great patterned papers, Jo. Love the papers you've used for the flowers! The PK face is so cute! Great job! I agree with Jeri. This card would cheer up anyone. I love the papers you used. Great job!! love the details on the flowers. such a pretty card, Jo!